Journal of Biomedical Science & Applications is a multidisciplinary, peer reviewed, open access journal that intends to publish cutting-edge research findings pertaining to multifarious key aspects of biomedical Sciences and its allied branches. 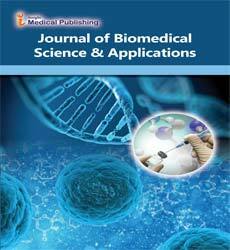 The Journal of Biomedical Science & Applications aspires to publish original scientific manuscripts that accentuate research and development of novel methods and tools for pharmaceutical and biomedical analysis; pathology and laboratory medicine. The broad scope of the journal encompasses multiple aspects of medical biochemistry, molecular biology, microbiology, virology, immunology, neurosciences, cell biology and regenerative medicine. Manuscripts that serve to provide novel insights into hitherto unexplored realms of study and clinical implication of biostatistics and epidemiology; cell and molecular pharmacology; experimental therapeutics; biomedical engineering and applied biomaterials are highly solicited. The journal employs editorial manager system for the submission and tracking of the manuscripts. The journal strictly adheres to a double blind peer review process to ensure the validity and fidelity of the published articles. Positive review by at least two independent reviewers followed by final approval of the editor-in-chief of the journal is mandatory for the publication of all citable manuscripts. Microbiology is the branch of biology that deals with the function, structure and uses of microorganisms. Microbiology includes several sub disciplines such as bacteriology, virology, mycology and parasitology. Virology is the study of viruses and virus-like organisms, including their taxonomy, pathogenic properties, cultivation and genetics. Virology focusses on the following features of virues i.e. structure, classification, pathogenicity, interaction with the host cell and their use in therapeutics and research. Medical biochemistry is the study of biochemical exchanges that occur within the human body in the context of medicine, usually in terms of drug interactions or cellular responses to disease or stimulation. Medical Cell Biology provides knowledge of the essential principles of the cell structure, functions and the most commonly used techniques and equipment. Medical Cell Biology covers the area like structural and functional heterogeneity of cells, characteristics, location and sequence of main cellular events, signalling molecules and mechanisms of their action, biological membranes, their structural organization and functions, transport across membranes, cell surface, its specializations, cell adhesion and communication, cell junctions, cell organelles, cell nucleus, its changes along the cell cycle and the cell death. Molecular biology is a branch of science concerning biological activity at the molecular level with the aid of following techniques: molecular cloning, PCR, blotting etc. Cell biology is the study of cell structure and function. Cell biology elucidates the structure, organization of organelles, properties, metabolic processes, signaling pathways and life cycle of the cells. Cancer can be defined as a disease in which group of unusual cells grow uncontrollably by ignoring the normal rules of cell division. The basis of cancer biology rests on a simple principle which states that fundamentally all mammalian cells share related molecular networks that control cell proliferation, differentiation and cell death. Biostatistics is defined as the branch of statistics that construes scientific data produced in biology and health sciences. Epidemiology is a branch of medical science that studies the distribution of disease in humans and the factors determining that distribution, mainly by the use of statistics. Pharmaceutical and Biomedical Analysis comprises of all the integrative features of analysis in the pharma and biomedical science, together with relevant advancements in analytical instrumentation, procedures, interpretation and computation. Proteomics is the study of proteomes, which is defined as set of proteins produced in an organism. It is used to examine protein expression, rate of protein production and degradation, the involvement of proteins in metabolic pathways, how proteins interact etc. The aim of proteomics is to identify all the proteins in the cell as well as genertate a 3D map of the cell indicating position of all the proteins. Biochemistry deals with the study of physico-chemical processes inside an organism. Molecular biology is related to the understanding of the interactions between the various systems of a cell, as well as the inter-relationship of DNA, RNA and protein synthesis and their regulation. Biomedical engineering is the application of engineering principles and concepts to medicine and biology for healthcare purposes. By combining engineering and medical sciences, it seeks to produce advanced healthcare treatments. Pathology, in general, defined as the study of diseases. Laboratory medicine is the branch of medicine in which specimens of fluid, tissue, or other body substances are examined in the laboratory. Pharmaceutical biotechnology is a relatively novel and advancing field in which the principles of biotechnology are applied for the development of drugs. The pharmaceutical companies use biotechnology principles such as RDT to design more effective protein-based drugs. Regenerative medicine is the application of treatments developed to replace tissues damaged by injury or disease. It also includes the possibility of growing tissues and organs in the laboratory and implanting them when the body cannot heal itself. Cell Biology is a branch of biology that studies the different structures and functions of the cell. ﻿Cell and Molecular Pharmacology and Experimental Therapeutics ﻿emphasizes on the molecular mechanism of drug action and the discovery and validation of new drug targets. Prominent areas include signal transduction, genomics and proteomics of membrane proteins. Biomaterial is any substance, engineered to interact with biological systems for medical purposes. The study of biomaterials is called biomaterial science.